Although the list of diseases affecting Chrysanthemums or garden mums is long, they are relatively trouble-free given full sun, fertile well-drained soil, and adequate watering. Maximizing plant vigor by appropriate cultural practices is an important disease management strategy. Leaf Spots: Chrysanthemums are subject to several leaf spot fungi including Septoria chrysanthemi, S. chrysanthemella, Alternaria species, and Cercospora chrysanthemi . Symptoms first appear as yellow spots which turn brown to black. Spots often occur on lower leaves first and can coalesce into large necrotic areas and finally death of the entire leaf. Regularly clean up and destroy infected plant debris and hand pick symptomatic leaves from lightly infested plants. Avoid splashing water onto plant foliage and water early in the day to allow foliage to dry quickly. In severe cases, applications of fungicides with the active ingredients with the active ingredients azoxystrobin, chlorothalonil, fludioxonil, iprodione, mancozeb, myclobutanil, propiconazole, pyraclostrobin, or thiophanate methyl may be applied according to label instructions. Powdery mildew ( Erysiphe cichoracearm ) as it name implies is characterized by a white to ash-gray powdery growth on leaves and occasionally stems. Foliage may become puckered or distorted; severely infected leaves will shrivel and die. The disease is most serious during hot, humid weather. Unlike most fungal diseases, free water is not required for Powdery mildew infection; high humidity encourages disease development. Powdery mildew can be avoided by proper plant spacing, good air circulation, low relative humidity, and adequate light levels. Apply preventive fungicides at the first sign of disease with the active ingredients copper, azoxystrobin, pyraclostrobin, fludioxonil, triflumizole, myclobutanil, triadimefon, propiconazole, sulfur, potassium bicarbonate, or thiophanate methyl according to label instructions. Gray mold ( Botrytis cinerea ) may occur on petals, leaves, or stem cankers as brown, water-soaked spots. Infected plant parts may be covered with gray to brown, powdery masses of spores. Senescing tissues are most susceptible. Gray mold is favored by extended periods of cloudy, humid, and wet weather. Practice good sanitation including removing senescing flowers and leaves. Avoid wetting flowers when watering and don't overcrowd the plants. Provide good air circulation and keep humidity low by a combination of heating and venting (See Fact Sheet on Reducing Humidity in the Greenhouse). Apply preventive fungicides as soon as disease is detected. Fungicides with the active ingredients chlorothalonil, dichloran, fludioxonil, trifloxystrobin, iprodione, mancozeb, copper sulfate pentahydrate, fenhexamid, azoxystrobin, and thiophanate methyl are registered for Botrytis control. Be sure to rotate applications among chemical classes as fungicide resistant strains of Botrytis have been reported. Rusts: Two species of Puccinia causes rust on chrysanthemums P . chrysanthemi and P. horiana . P. chrysanthemi is most common in late summer and is characterized by dirty-brown pustules and yellowish-green spots on upper surfaces of leaves. P. chrysanthemi causes minor damage in the field and is uncommon on greenhouse plants. Severe infestation may damage large areas of leaves and lead to defoliation and reduced flower production. Chrysanthemum varieties resistant to rust include 'Achievement', 'Copper Bowl', 'Escapade', 'Helen Castle', ' Mandalay ', 'Matador', 'Miss Atlanta', 'Orange Bowl', and 'Powder Puff'. P. horiana causes Chrysanthemum white rust and as a recent introduction to the United States is subject to quarantine and an eradication program. Symptoms are white, pinkish or brownish pustules produced on leaf undersides with white, yellow, to pale-green lesions on upper leaf surfaces. 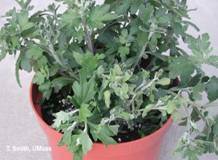 Chrysanthemum white rust results in leaf distortion, discoloration, defoliation, and plant death. White rust is primarily a disease of greenhouse crops; when it occurs outside direct sunlight and low humidity kill the spores. Contact state and federal agricultural officials if any suspect white rust infections occur and destroy all plants. Regulations require that infect plants be destroyed to prevent disease establishment in this country. Protect healthy plants with fungicides with the active ingredients azoxystrobin, chlorothalonil, fludioxonil, iprodione, mancozeb, myclobutanil, propiconazole, pyraclostrobin, or thiophanate methyl may be applied according to label instructions. (See Chrysanthemum White Rust Fact Sheet). Bacterial leaf spot (Pseudomonas cichorii) : Symptoms of bacterial leaf spot are tan to dark brown spots or blotches that are often bordered or ringed by yellowing tissue. Discoloration may be prominent along leaf veins or lesions may become angular as bacteria growth is limited by major veins. Leaf wilting and death often follow. Bacteria persist in or on infected plants, crop debris, infected seed, contaminated soil, and infested pots and tools. Key management practices include planting pathogen-free seed and cultivars, resistant varieties, good sanitation, and avoiding overhead irrigation or handling plants when they are wet. Once plants become infected with bacteria, it is best to rogue infected plants and those near them before the disease spreads. Bactericides such as copper and antibiotics are of limited effectiveness and plants cannot be cured. Bacterial blight (Erwinia carotovora ): Symptoms of bacterial blight extend beyond plant leaves to include water-soaked lesions on stems, darkening and death of buds and stems, blackening of terminals, and wilt and collapse of upper portions of the plants. Infected cuttings may have brown to black decay at their base. Bacterial blight survives in crop debris and is favored by surface moisture, high temperatures, and high humidity. It is easily spread on infested tools, hands, or plants. Start with pasteurized growing media, use pathogen-free cuttings, reduce humidity and increase air circulation, avoid wetting foliage, practice good sanitation, and regularly inspect crops and dispose of infected plants. Foliar nematodes (Aphelenchoides ritzema-bosi ): The development of yellow to brown, angular spots on lower leaves which advance up the plant is a good indication of nematode infection. Nematodes are microscopic roundworms that live in the soil or in infested plant material. Nematodes swim in a film of water on plants to spread to uninfected leaves. Lesions on the leaves eventually coalesce to cover the entire leaf which dies, withers, and falls. Carefully inspect cuttings and plants received from propagators. Remove infested plants and crop debris. Avoid wetting the foliage and overhead irrigation. Viruses and other infectious agents: Chrysanthemums are susceptible to a large number of virus diseases including Chrysanthemum Mosaic Virus, Impatiens Necrotic Spot Virus, Tomato Aspermy Virus and Tomato Spotted Wilt Virus. Viroid diseases include Chrysanthemum chlorotic mottle viroid and Chrysanthemum Stunt viroid. Aster Yellows is a serious disease caused by organisms called phytoplasmas. Symptoms of virus (viroid) infected plants include stunting, spindly growth, and formation of dense rosettes. Flowers may be small, distorted or exhibit streaking and color break. Leaf symptoms are diverse and may appear as leaf yellowing, ring spots, lines, mottling, mosaics, vein clearing, distortion, crinkling, wilt and leaf drop. Aster Yellows results in chlorotic foliage, plant stunting, spindly, upright yellow shoots, few or no flowers, flower distortion and failure to color. Many of these diseases are spread by sucking insects such as aphids and leafhoppers. There is no cure for virus, viroid, or phytoplasma infected plants. Start with pathogen-free plants from a culture indexing program. Remove and destroy infected plants. Remove weeds that may be hosts. Control the insects that transmit these diseases. Wash tools and equipment used near infested plants with an appropriate greenhouse disinfectant. Chrysanthemums are subject to two vascular wilt diseases caused by Fusarium oxysporum f.sp. chrysanthemi and Verticillium dahliae. Both pathogens persist in the soil for many years. Fusarium Wilt: The first signs of this disease are yellowing of foliage, stunting, and wilting often along one side of plant. 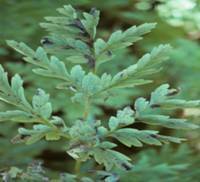 Plants may appear water stressed and foliage may brown and die. Stems show a reddish brown discoloration of the vascular system. Fusarium is spread in contaminated soil and infected cuttings and is favored by warm temperatures, high relative humidity, overwatering, and poor drainage. Start with pathogen free cuttings or plants and pasteurized growing media. Adjust pH to 6.5 to 7.0 and use nitrate nitrogen fertilization. Avoid highly susceptible cultivars such as 'Bravo', 'Cirbronze', 'Illini Trophy', 'Orange Bowl', 'Royal Trophy', and 'Yellow Delaware'. Verticillium Wilt: Symptoms of Verticillium wilt often appear only after blossom buds have formed; young vigorous plants may be symptomless. Foliage becomes yellow and wilted, sometimes only along leaf margins and on one side of the plant. Leaves begin to die from the base of the plant upward and often remain attached. Stems may exhibit dark streaks in the vascular system. This disease is favored when cool weather is followed by hot temperatues. Start with pasteurized growing media and pathogen-free cuttings. Most cultivars are resistant. Avoid susceptible cultivars including 'Bright Golden Ann', 'Echo', 'Glowing Mandalay', Mountain Peak', 'Paragon',, 'Pert', 'Puritan', and 'Wedgewood'. Ray Blight: Caused by Didymella ligulicola , this disease affects the ray florets and may extend into floral stalks. Lower leaves and stems can also be affected. Symptoms include a blackish rot of ray florets and flowers may be deformed and one-sided. Bud blast can occur in severe cases. Lower leaves and stems can rot, and foliage may distort or die on one side of stem. D. ligulicola persists in plant debris and spores are spread by wind and water. The disease is favored by overhead irrigation or rain. Start with pathogen-free cuttings. Avoid wetting foliage and flowers and keep humidity low. Protect foliage with fungicides with active ingredients including azoxystrobin, chlorothalonil, fludioxonil, iprodione, mancozeb, myclobutanil, propiconazole, pyraclostrobin, or thiophanate methyl according to label insructions. Ray Speck: Stemphylium lycopersici causes small, necrotic, light brown to dark brown lesions which may coalesce and cause blossom death. The pathogen is favored by wet conditions and temperatures between 60° to 85° F. Rogue and dispose of infected plants. Provide good air circulation and don't overcrowd plants. Avoid overhead irrigation and keep plants dry. Like all floricultural crops, Chrysanthemums are subject to root and crown rots caused by species of Pythium, Phytophthora, and Rhizoctonia. See Root Diseases of Greenhouse Crops Fact Sheet. Dreistadt, S.H. 2001. Integrated Pest Management for Floriculture and Nurseries. University of California Division of Agriculture and Natural Resources. Publication 3402. Prepared by M. Bess Dicklow, UMass Plant Diagnostic Laboratory. University of Massachusetts.